Figure 10-11. 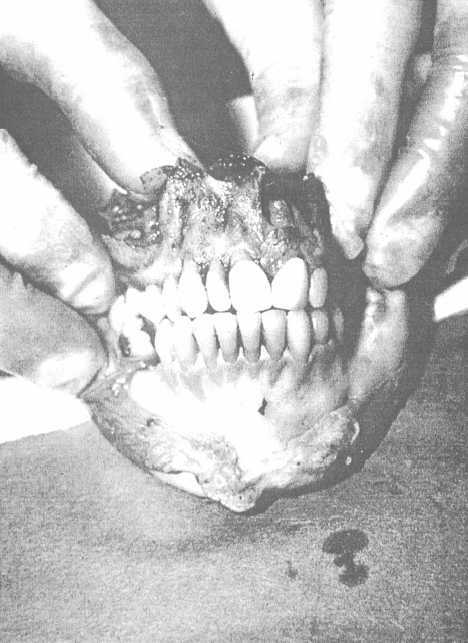 - Exposed maxilla and mandible. In small operations with minimal number of remains to be processed, equipment is not a major consideration. However, as the number of remains increases, the availability of equipment becomes a major determining factor in the efficiency of the dental Id section. In situations where hundreds of remains require ID, you should have as many X-ray machines available as possible to speed up the initial processing of the remains. Postmortem radiographs are obtained from regular floor-mounted, mobile endodontic, and portable military field types of dental X-ray units.